Photovoltaic (PV) inverter market size will surpass USD 11 Billion by 2024, as reported in the latest study by Global Market Insights, Inc. Favorable regulatory initiatives to promote the use of renewable energy coupled with large scale fund flow toward renewable grid integration will enhance the global photovoltaic (PV) inverter market size. In 2017, over 70% of global photovoltaic industry has been driven by monetary incentives and over 10% through net metering worldwide. Rising stand-alone power demand favored by ongoing development of microgrid infrastructure will further stimulate the industry outlook. Rapid urbanization coupled with favorable regulatory reforms to reinforce the declining small-scale industries across emerging countries will augment the single phase photovoltaic inverter market. Ongoing renewable energy network integration followed by positive government measures including various incentives to sustain the technological adoption will further enhance the industry growth. Three-phase units on account of their operational effectiveness across large scale industrial establishments and transmission networks hold major revenue share. Furthermore, the growing demand for reliable electricity across industries together with oil & gas and mining will further complement the product penetration. The China PV inverter market is predicted to witness an annual installation of over 25 GW by 2024. Favorable government initiatives toward energy conservation and positive customer outlook toward the deployment of renewable energy will propel the overall industry outlook. As per IRENA, in 2017, the total installed capacity for photovoltaic industry increased to 93 GW across the globe. 230 - 400 V photovoltaic inverter market in 2017 surpassed USD 500 Million. Growing deployment across the downstream sector coupled with rising product consignments to China will nourish the business outlook. 400 - 600 V PV inverter market is projected to grow owing to their large-scale implementation across industrial installations along with favorable utility aided solar installation amenities. MEA region, in 2017, experienced a strong growth subject to Turkey’s contribution toward new product installations of over 2.5 GW. Commercial PV inverter market is predicted to expand at a rate of over 6% by 2024. Positive regulatory prospects across emerging countries focusing on decentralized power generation along with rapid improvement of distributed power generation technologies will favor the global industry landscape. Extensive plans to reduce GHG emissions along with growing demand for reliable and clean energy will boost the utility deployments. Integration of renewable energy initiatives and solar targets along with FiT, tax benefit and other monetary leveraging provided by regulators will sway industry dynamics. 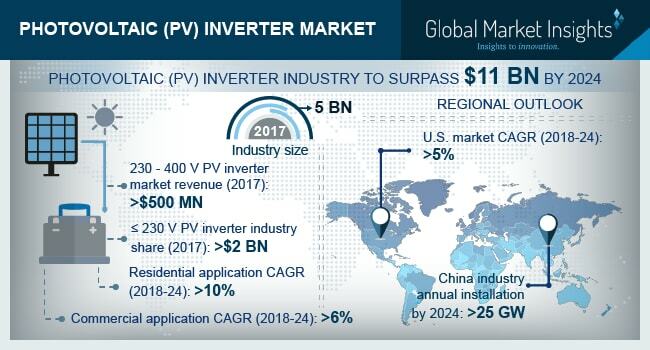 The U.S. PV inverter market is estimated to grow on account of favorable regulatory reforms towards energy conservation favored by positive consumer inclination towards the integration of sustainable networks will further complement the business outlook. In 2017, the U.S. annual solar installed capacity accounted for over 380 MW in line with the majority projects deployed across Minnesota and Massachusetts. Eminent industry players operating in the PV inverter industry comprise of Sungrow, SMA Solar, Enphase Energy, Tabuchi, Schneider Electric, Elettronica Santerno, Panasonic, TMEIC, Furukawa, Shenzhen, Growatt, REFU Elektronik, Solar Edge, Delta, SatCon, Sineng, Chint, TBEA, Omron, Fronious International, Samil Power, KACO New Energy, Emerson Electric, SolarMax, ABB, General Electric, Huawei.